Sometimes, no matter how diligently we look after our teeth as adults, we need to have one pulled. Dr. Anthony Farole, an experienced oral and maxillofacial surgeon who cares for patients near Philadelphia and Bala Cynwyd, offers helpful perspectives on the reasons for an extraction, what to expect and how to plan for replacement of the missing tooth with a dental implant. Though permanent teeth were meant to last a lifetime, there are many valid reasons that teeth may need to be pulled in adulthood. A Crowded Mouth: This is common in teens and young adults, but can pose a problem at any age. Sometimes dentists pull teeth to prepare patients for orthodontia. The goal of orthodontia (or braces) is to properly align the teeth, which may not be possible if your teeth are too big for your mouth. Likewise, if a tooth cannot break through the gum because there is not room in the mouth for it, your dentist may recommend pulling it. 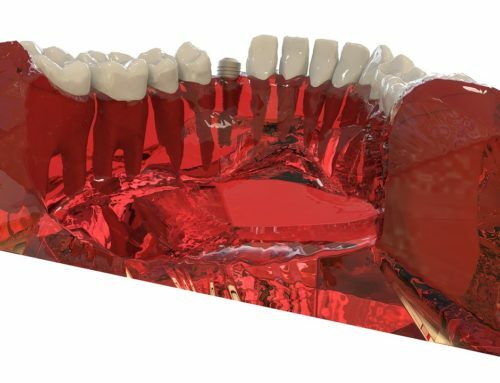 Infection: If tooth decay or damage extends to the pulp — the center of the tooth containing nerves and blood vessels – then bacteria in the mouth can enter the pulp, leading to infection. Often this can be corrected with root canal therapy, but if the infection is so severe that a root canal or antibiotics cannot cure it, extraction may be needed to keep infection from spreading. Risk of Infection: If your immune system is compromised — for example, if you are receiving chemotherapy or are having an organ transplant – the slightest risk of infection in a particular tooth may be reason for extraction. Gum Disease: If a periodontal disease — an infection of the tissues and bones that surround and support the teeth — have caused loosening of the teeth, it may be necessary to the pull any affected teeth. What can I expect during tooth extraction? Before pulling the tooth, Dr. Farole will give you an injection of a local anesthetic to numb the area where the tooth will be removed. If you are having more than one tooth pulled, or if a tooth is impacted – meaning it’s tightly pressed between gums, bones or other teeth– you may receive a general anesthetic. This will prevent pain throughout your body and allow you to sleep through the procedure. If the tooth is impacted, Dr. Farole will cut away gum and bone tissue that cover the tooth and then, using forceps, grasp the tooth and gently rock it back and forth to loosen it. Sometimes, a hard-to-pull tooth must be removed in pieces. What happens after my tooth is pulled? Recovery from a dental extraction typically takes a few days. The following steps will help to minimize discomfort, prevent infection and promote healing. — Take pain relievers as prescribed. — Bite firmly but gently on the gauze pad that Dr. Farole has put in place to reduce bleeding and allow a clot to form in the tooth socket. — Change gauze pads at home according to the doctor’s directions. — Apply an ice bag to the affected area immediately after the procedure to keep down swelling. — Relax for at least 24 hours after the extraction. Limit activity for the next day or two. — Avoid rinsing or spitting forcefully for 24 hours after the extraction to avoid dislodging the clot that forms in the socket. — After 24 hours, rinse your mouth with a solution made of 1/2 teaspoon salt and 8 ounces of warm water. — Do not drink from a straw for the first 24 hours. — Do not smoke, which can inhibit healing. — Eat soft foods, such as soup, pudding, yogurt, or applesauce the day after the extraction. Gradually add solid foods to your diet as the extraction site heals. — Continue to brush and floss your teeth, and brush your tongue, but be sure to avoid the extraction site. Doing so will help prevent infection. Dental implants have become the preferred method for replacing teeth that have been surgically removed. Dr. Farole has helped thousands of patients in the Philadelphia and Bala Cynwyd area to restore their smiles with implants. After you’ve recovered from your extraction, Dr. Farole will work closely with you to plan for a successful dental implant procedure. Just as he does with the extraction process, he will guide you through the steps and make sure your questions are answered. If you’re worried about a painful tooth that needs extraction, don’t wait – call Dr. Farole’s office in Bala Cynwyd today. We’ll be happy to schedule an appointment for you right away.